A 57-year-old man in a pickup truck was killed in a head-on collision in Escondido with a Honda Accord, a police lieutenant said Saturday. 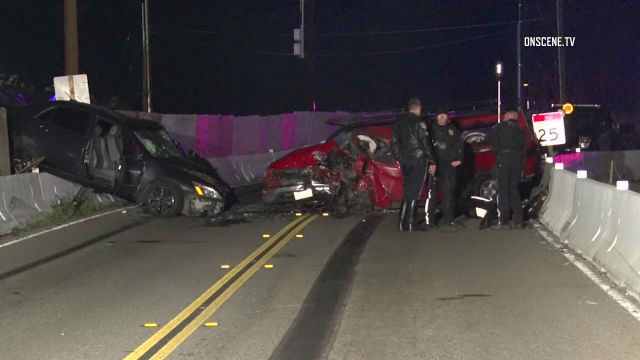 The crash involving a 2005 Honda Accord and a 1996 Toyota Tacoma occurred on Valley Parkway, north of Beven Drive, said Escondido Police Lt. Michael Kearney. The Honda was going west on Valley Parkway and the pickup truck was going eastbound on Valley Parkway, just north of Beven Drive, at the time of the crash, Kearney said. Police were dispatched to the scene at 11:30 p.m Friday. The pickup’s driver was pronounced dead at the scene and paramedics rushed the a other motorist, a 36-year-old man, to Palomar Medical Center, where he was being treated for non-life threatening injuries. Escondido police asked witnesses to the crash to call them at (760) 839-4470.